Summary Having both lived in the Middle East for a number of years, our interest in travelling to yet another Arab country was not very great until we came across an advertisement for an escorted tour in the Caravan and Camping Club magazine. This generated a spark of interest along with reports I had seen earlier on the internet, we both also fancied visiting somewhere different. 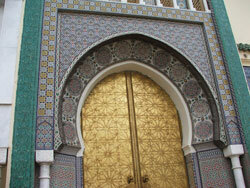 Morocco is certainly different to anywhere else we have been and we both thoroughly enjoyed the experience. Had we made the trip alone, I doubt we would have seen half the places visited or learnt quite so much about the country. Morocco was a unique experience and we are glad we put our reservations aside and did it. We drove all the way from home and back using the Tunnel to cross the Channel, a total journey of just 3 miles short of 5000 miles of which 1547 were in Morocco. The average cost of fuel was: France £1.06 per litre, Spain £0.96 per litre and Morocco £0.59 per litre. Our average fuel consumpion was 22.4 m.p.g. and we were away for a total of 43 days, 22 of which were spent in Morocco. Best saving – Fuel costs in Morocco. Days 1 to 7 - outward through France to the tour meeting point. Camping Municipal Zaragosa is a new site and the roads to it were not on my sat nav. However, the positioning was correct and we soon spotted a sign pointing the way. A good sized serviced pitch cost an expensive Eu26 for the night but we had the luxury of free WiFi, electricity to charge all our phones etc and ample water for showers in a heated toilet block. Day 5. The day dawned brighter and the sun was shinning as we set off down the A23 autovia towards Valencia and the A7 Autovia de Mediterranea. The roads were initially very quiet and we made good time via Tereul until we met the Easter holiday traffic returning home on the A7 around Valencia. After a short delay we were soon on our way again towards Alcoi and Alicante arriving at my brother's villa in the late afternoon. The cold beers in the sunshine on the patio were very welcome. The days run 316 miles. Day 6. 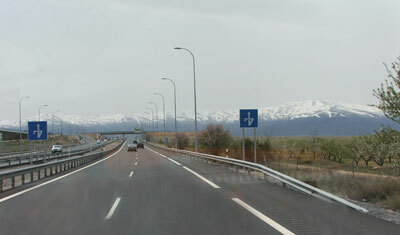 A dull chilly day dawned as we continued down the A7 and the A92 past snow capped mountains to Granada and then the A92/A45 to Malaga. It remained overcast all day but the rain held off and we had a good run. However, Malaga Monte Parc, our next destination, was not where I had marked it on the sat nav and no one I asked knew where it was. We found it more by luck than judgement and settled in for a two night stay. The days run 305 miles. Camping Malaga Monte Parc was very reasonably priced at Eu29.40 for the two nights for a serviced pitch with 6 amp electricity. 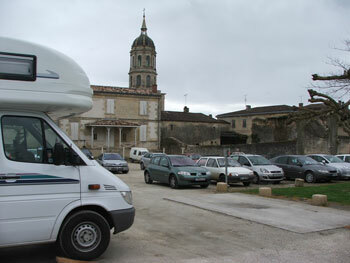 Some of the pitches could be a bit tight for larger motor homes but we found one which suited our needs and settled in. The site is split in two, one half catering for mobile homes, the other for tourers. Whilst the site is a bit isolated, it is in a scenic area and there is a bus about every half an hour between Alhurin de la Torre and Alhaurin el Grande and there are restaurants close by. You could easily spend a very pleasant few days here. Day 9. Disturbed by a truck entering the parking area at 0450hrs we arose early and were ready for the 0745hrs start in order to catch the 0930hrs ferry from Algeciras to Ceuta. Check in went smoothly, if somewhat slow, and with the help of Ray the tour guide we were parked on the car deck close to the lift with room to deploy our ramps. The days weather was the opposite of yesterday. It was overcast and there was a strong wind blowing making the crossing uncomfortable. Nevertheless we were impressed with the ship and the hour and half’s crossing passed quickly. Ray ensured the border crossing into Morocco went smoothly and all thirteen vans were through and parked up at the destination campsite in Martil quicker than expected which left plenty of time for a briefing and exploration of the town. Our local tour guide Hamid joined us here. The days run 33 miles. Camping Al Boustane. A level but very basic site, small marked pitches or park on the wider access roads. Adequate for a short stay and not far from the sea front. Martil Is nothing special and unfortunately its ambience was not enhanced by the amount of street works being undertaken on what will eventually be a pleasant sea front walk, but after the long trip down the opportunity to take a stroll around and start to get a feel for Morocco was welcome. The town itself is level and there are some dropped curbs and with help it is fairly easy to get about as long as the street works could be avoided. Day 10. We were woken by the Mullah’s call to prayer at 4a.m. and neither of us could get back to sleep so arose early and finally left site a 0845hrs. We headed back to the main road and stopped at a large supermarket for a few bits and pieces before setting off to our next destination, Camping Azillan at Chefchaouen. We didn't travel in convoy, the usual procedure is to depart when ready or at an appointed time, one tour guide took the lead, the other brought up the rear and vehicles could be strung out over many miles over the route you followed from the issued guide. 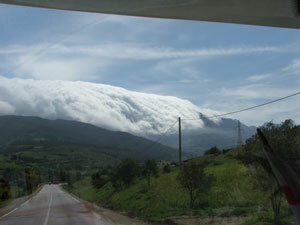 The scenic journey via Tetouan and the Rif mountains wasn’t very far, only about 70Kms. It wasn’t long before the sun broke through, the skies brightened and where the cold northern air met the warmer air from the Sahara, the white clouds tumbled down the side of the mountains like a large fluffy waterfall. An enthralling sight. The climb up the hillside to the campsite at Chefchaouen was torturous but it was well signed and we got there without mishap at about lunch time. There was a less tortuous route but this route was closed due to road works. The days scenic run was about 45 miles. Camping Azillan. A basic site by European standards but perfectly adequate for a nights stay. Great views, fairly level parking for motor homes if a little close together and ample electrics. 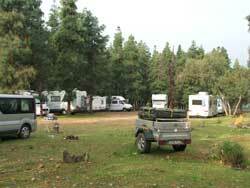 There was a large area at the front of the site where motor homes could easily park but behind was wooded. It sloped steeply, was terraced and was more suited to tents. Chefchaouen. It was far too steep a descent into the centre of town for us to walk, Ray kindly gave us a lift and after a coffee in one of the local cafes we wandered around as best we could along the narrow winding cobbled alleys of the old town. We were finally defeated by flights of steps so returned via the souk to the main square where we settled down in a café for a mint tea and to watch life go by. Very few women wear the full veil but they do dress very smartly and colourfully for their evening stroll and wear head scarves. 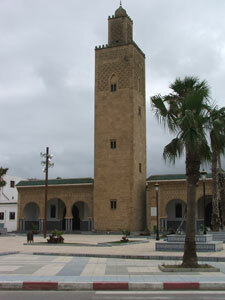 The Islamic culture was more relaxed in Morocco than we had encountered in the Middle East. We eventually decided to have a local meal here. The bill for a main tajine course with bread and olives and a drink came to Dh125 (about £10) for the two of us. We caught a taxi back for Dh20. Even though the wheelchair could be disassembled it wouldn't quite fit in the boot of the taxi. The driver was unconcerned and left the boot open. I was concerned it would fall out during the steep ascent back to site but thankfully it didn't! Days 11. An early start, an 0800hrs briefing before following our guide back down the torturous route to the main road and heading for a wild camping spot near the Roman ruins of Volubilis. Once again, in fine weather, we headed through the Rif mountains towards our destination, stopping briefly for coffee in a large layby then continued on to a typical Moroccan roadside restaurant where we stopped for Kefta and barbequed lamb chops served with ample bread and a fresh orange drink. Dh130 for the two of us. Progress was then slower across wide rolling plains where the recent heavy rains had turned these into lush green pasture on which goats, sheep and occasional cows were herded by their shepards. Donkeys, trotting by the roadside laden with cargo or riders or even both, were frequent hazards. As the roads became narrow and rougher, progress slowed and care was needed to avoid the potholes and rougher areas. We arrived at our camping spot at about 1430 which left time for me to climb the nearby hill overlooking the ruins of Volulibis. The day ended with an evening around a campfire with nothing but the stars to light the night sky once the fire had died down. However, we did not sleep well, the road by the site being very busy all night in addition to the barking of nearby dogs. In truth I was probably not tired enough to go into a deep sleep. The days run about 120 miles. Day 12. An 0900hrs start saw us parked early outside the entrance to the Roman ruins only 3Kms away for a guided tour which was very interesting. Today was a short run via Meknes to Fes along much better roads. The landscape changed rapidly from gently rolling hills to flat featureless plains as we approached Fes on the toll motorway. The good directions provided enabled us to quickly find Camping International Fes and we settled in before lunch and had a welcomed quiet afternoon catching up on house keeping chores and enjoying the sunshine in what was now much warmer temperatures than the past few days in the mountains. Today the run was 68 miles. Camping International Fes A level site with much better facilities than our previous two sites. The showers have heads and there is hot water! These were much enjoyed by all! Pitches are individually marked and although not large we have more space than previous campsites. We are here for two nights. Day 13. 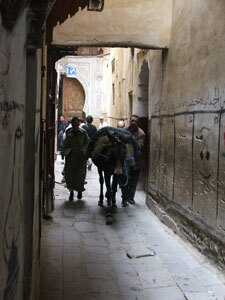 Fes The Medina, the old town, is an experience not to be missed. An optional day tour with a guide had been arranged for us using two mini buses so it was not too difficult to lift Wendy into the front passenger seat and there was a large enough boot to take the wheelchair and trike which I had been advised was essential for a trip along the narrow poorly paved alleyways of the souk. Our first visit of the day was to see the imperial palace entrance followed by a trip to the heights above for a view of the city which houses over a million residents. The new city is quite modern with dual carriageways, palmed avenues and fountains, the old city is little changed from it origins some of which date back to the 9th century. The city was a lot larger than I had imagined and is a World Heritage site and attempts are being made to preserve its 15kms of city walls and its many old buildings. On our descent to the old city we were taken to a pottery to watch artisans hand painting pottery and making mosaics both being labour intensive tasks demanding skill and patients. Some of the work was staggeringly intricate and beautiful. The old city is a must see but you do need a guide. It is a maze of narrow alleys where its many craftsmen using old time methods can be seen at work and the poorest eke out a living from tiny shops. You will almost immediately be met with the not unpleasant predominant smells of spices and cedar wood occasional mixed with mule droppings which appeared to be quickly cleared up into plastic bags for later disposal. The only way to transport goods in and out of this labyrinth is by porterage using a hand cart or mule and it was often difficult to pass such in the narrow confines of the passageways. During this visit we were taken to see Moulay Idris’s tomb, the oldest mosque in Africa which can accommodate 20,000 worshippers, a Madrasa, a carpet factory and the Tannery. Lunch in a Moroccan restaurant was an option of which all availed. Day 14. This was supposed to be a short days drive of 75Kms along the N8 via Ifrane to the Cedar Forest just south of Azrou in the mid Atlas Mountains. However, after stopping for a coffee and local pancake in the village of Imouzzer, we missed a turn in the up market town of Ifrane and ended up going the long but more scenic way round. Several others also made the same mistake and it was quite comical if not a little worrying to encounter two of our group going in the opposite direction! Ifrane in complete contrast to anywhere else so far visited was smart and manicured with Swiss style housing. The days run 85 miles. Cedar forest wild camp. We pulled into the clearing on the edge of the forest at about 1330hrs, ate a hurried lunch and went for a short walk but the track was very steep and got the better of us so we returned to camp to relax and chat in the sunshine. Some of the group ventured further and encountered some barberry apes who of course expect to be fed by all the tourists. In the evening a tasty filling meal was cooked for us by our guides, Ray, Steve and Hamid and after eating we sat a while longer round the camp fire for a briefing and a chat about the days events and what we could expect tomorrow. Day 15. It had been a cold night at 6000ft in the mid Atlas Mountains but the day dawned bright and it soon warmed up and we were on our way by 0800hrs. We quickly left the forest behind and were soon driving through open rolling green countryside with hardly a dwelling place in sight. In the distance we could see the snow capped high Atlas Mountains. The vegetation became sparser as we journey southwards down the N13 which for the majority of the route was well surfaced. 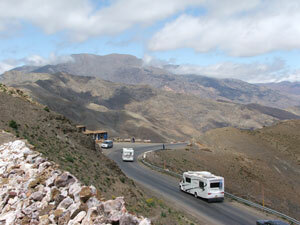 We crossed a dusty plain passing through Midelt and were soon climbing the foothills of the High Atlas mountains. 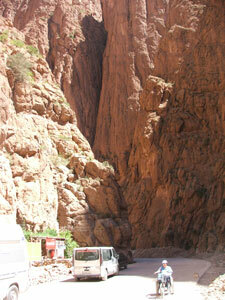 The road twisted and turned its scenic way upwards to the the Legionaires Tunnel and the Gorges du Ziz. We stopped for lunch here before making the descent to Er-Rachidia. Just before the town the road overlooks and then runs alongside a large reservoir which, although surrounded by barren countryside was the bluest we had ever seen. In the distance the desert. On leaving Er-Rachidia we passed our first herd of camels and soon arrived at our destination of Camping Source Bleue de Meski. Two nights are scheduled here. The days run of 167 miles was by far the most varied and scenic of the trip. Camping Source Bleue. Set amongst an oasis of date palms and a natural spring in the valley of the Ziz, the site is basic. There are no marked pitches and the electrics are very, very poor and there are not enough to meet requirements. It is fairly level once into the site whose approach is down a steep cobbled ramp. Day 16. A day touring the local area with our guide for the day, Benny. In the morning we were shown around the local village of Meski and learnt something of the way the villagers lived. The two hour tour finished with an invitation to view Benny’s house, meet his wife and take tea with him. Mint tea, bread dipped in olive oil, nuts, dates and figs were served. In the afternoon we were taken to the old Kasbah, now in ruins. This was a walk through their fields and palm groves, across the river Ziz to the other side of the canyon and a rough climb up into the old Kasbah. Little of the old fortified village is recognisable but Benny pointed out some of the features and explained some more about village life. 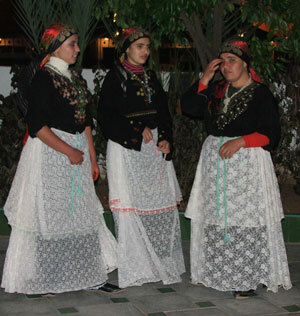 Moroccan culture is a much more relaxed, happy go lucky way of life than I had experienced in the Middle East. Whilst the majority are poor, their culture, at least in the villages, ensures the strong support the weak and no one appeared discontented with there lot in spite of the lack of the modern amenities that we take for granted. In the evening we had an excellent three course Moroccan meal in the Café Source Bleue. This consisting of a soup starter followed by cous cous with chicken and vegetables, rounded off with local fruit. Lively entertainment followed provided by a well known local musician and band. Day 17. The day began with a visit to the local infants school. Schooling in the village begins at three years of age, children then move to the primary school until 12 before being bussed into the nearest town to finish their education. 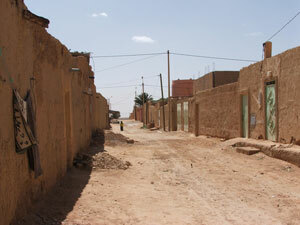 Following this visit we set of south down the N13 heading for Rissani, the last town before the Sahara. A stop on route at a fossil sales room gave the chance to see how the fossil bearing rock of the area is turned into works of art. We purchased a stone platter dish from their retail outlet. The landscape was now almost devoid of vegetation as we pulled into Rissani for last minute essentials and lunch before heading into the Sahara. After a short run, and with a strengthening wind developing, we turned off the tarmac road and followed the van in front along the desert track for about 8Kms before arriving at the edge of the Erg Chebbi dunes. The wind was whipping up the sand making it very unpleasant to be out and about and the very fine grit got everywhere. The daily run was 68 miles and it was the furthest south we travelled this being 2135miles from Calais. We retired to a nearby Auberge for a briefing, a chat and a drink. Almost everyone retired early for some had to rise at 4a.m. for a camel ride into the dunes to watch the sun rise. Day18. I rose early to catch the sunrise over the dunes. Camel rides were totally impractical for us! However even from my limited vantage point I was struck by the ever changing colour of the dunes as morning’s light slowly spread across the desert. It was to be a quiet day for us. We took an early walk to the next Auberge about a mile away and watched a party of abut 20 tourist on camels returning from an overnight stay at a Berber camp. We chatted to one of them for a while and returned for a drink at the Auberge near our camp and lazed around in the sunshine on a much calmer day. At 1630hrs we saw off those of our party on their camels for the trek across the dunes to an overnight Berber camp. The fine weather didn’t last, and whilst sat around having an evening drink with fellow travellers, the skies darkened and the wind whipped the sand up again and we all made a mad dash for shelter until finally retiring for the night. Day 19. When the wind blows the fine sand gets everywhere, you even end up eating it! It's impossible to keep out, the engine compartment is covered in it and I dread to think what it looks like behind the fridge, it must have come through the vents. We didn’t take the covers off the gas water heater until the wind abated and once we had heated the water we put the covers back on. In the end we decided to leave the clean up until once out of the desert. 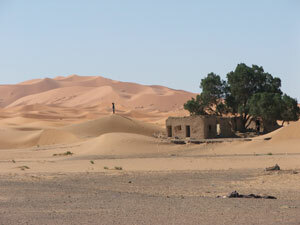 Today we have booked a 4x4 ride round the Erg Chebbi dunes. We visited the Mazouga Oasis, Meski was better. We then went on to a soda lake where 72 different species of bird can be found. Flamingos could be seen at the far side with the aid of binoculars and camels grazed near by and the usual vendors descended on our party to ply their wares. Their persistence can be rather tiresome. It was then on to a village where the descendents of African slaves live. 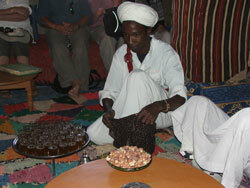 We were entertained with their music and dance and given tea and nuts, not uninteresting in small doses! A drive across the desert followed to an abandoned mine near the Algerian border, interesting views but not much else. A visit to a Nomad camp should have then followed but most of the party did not want to be pestered by vendors once again. We had all brought along a picnic so the alternative was find a shady palm for lunch. Unfortunately the palm grove the driver knew had been fenced off so we had to find single palms for shade. Once again we were descended on by vendors who just appeared like magic from the desert. These were mostly children who had some interesting wares to sell, some undoubtably made by themselves. I had little change, so elected to give them some dirhams rather than buy anything. With that we were back at camp by 1430hrs. Not one of the better trips so far but it did give an appreciation of the desolation of the desert. Wendy rested and I, armed with a bottle of water and a compass, set off for a dune walk. Even though I intended to stay within sight of camp, if the wind whipped up the sand, it could soon be hidden from sight. It stayed fine and clear but hot. The views, from atop the dunes across the plains to the distant hills, were stunning and the effort was well rewarded. In the evening a Moroccan buffet meal had been laid on for us in the Auberge du Sud, very good it was too along with an entertaining Moroccan duo on a drum and violin. Day 20. Today we leave the desert for the Todra Gorge. The day was fine and the wind light and the drive back to tarmac was uneventful. After a brief coffee halt to look at an ancient canal system tunnelled under the barren plains to bring water to the nearby town, we stopped in Tinejdad for some groceries and then a couple of miles outside of town stopped at the Museum Les Sources for lunch and a visit. What a fascinating place. The source of a natural spring which bubbled to the surface had been turned into a museum by the Moroccan artist owner and displayed many aspects of past and present Moroccan life which he had collected over 25 years. All were thoughtfully displayed. Our journey continued along the edge of the High Atlas Mountains and we arrived at Camping Soleil for a two night stay at about 1530hrs after a days run of 124 miles. Camping Soleil. One of the better sites so far encountered, small but clean and tidy with nice restaurant and swimming pool. The washing machines worked and we managed to complete all our laundry. There was free WiFi too. The entrance to the gorge was about 5 miles away. Day 21. Ray, Steve and Hamid prepared a Moroccan breakfast for us all this morning and we had a briefing before we all set off up the gorge. You can walk or ride a bike to it or even take a motor home through the gorge. There is limited parking in the gorge but Ray the tour guide wouldn’t hear of us walking up there and kindly offered us a lift dropping us off at the entrance. We then walked the 1000yds or so up the most impressive section to rejoin him in a café which to access you had to cross a river by a rickety bridge which was just wide enough to allow the power trike to cross. We then continued our walk up the gorge to be picked up again to travel its full length of about 20 miles and then returned to the campsite for lunch. We spent a lazy afternoon by the swimming pool reading and catching up with news via the internet. We had an evening meal in the campsite restaurant which we had to pre-order. We chose a simple menu of soup, lamb brochettes with chips and a mint tea with Moroccan pastries. However the lamb turned out to be beef, or perhaps it was goat, which was on the tough side and Wendy gave most of hers to Ray for his dog. Day 22. Another fine day dawned as we headed for Ouarzazate (pronounced was-za-zat) on the N10 along the wide ‘Valley of Dades’ which I think translates to Valley of Roses. On the right in the distance the snow capped mountains of the High Atlas and on the left a low range of mountains of the Jebel Sarhro. In the fertile soil where water is plentiful roses are grown and made into a range of rose scented products. Children could often be seen standing by the roadside offering rose garlands for sale. We stopped at a range of small tourist shops near El Kelaa M’Gouna and purchased three bottles of Eau de Cologne for about £6 and a cotton scarf for £4 before eventually arriving at the rather poor Camping Municiple of Ouarzazate. The days run was 107 miles. Camping Municiple. The site was level with poor facilities and rather dusty with hardly any shade and was 3miles from the centre of Ouarzazate which we eventually found after a longer walk than necessary. This left little time to look around the local souk. After a drink of fresh orange we walked back to site for the evening. We found Ouarzazate a tider town than most with wide streets which had some of the better pavement areas so far come across although care was still needed to avoid high kerbs and damaged areas. Day 23. Our briefing today was at 8a.m. with the departure straight afterwards via the N9 and the Tizi-n-Tichka pass. A run over the High Atlas full of breath taking scenery, steep climbs, descents and twists and turns. However we found most of the road surface in better condition than some we had travelled and we took it slow and steady stopping frequently to take photos. We had a coffee stop at the highest point of 2260 metres before making the dramatic descent down to the plains and Marrakech. The weather was glorious and visibility very good and it was a very interesting 7 hour drive. However it was marred by the tail pipe of my exhaust falling off, the punishing road conditions of previous days finally getting the better of it. I picked it up and carried on and would see if a fix could be applied during our stay in Marrakech. We arrived at Camping Ferdaous at about 1500hrs for a three night stay. The days run was 132miles. I re-attached the exhaust tail pipe using the original clamp and an empty chopped tomato tin, ends removed and slit along its length. It ended up a little shorter than before but still took the exhaust gases clear of the motor home. Steve the mechanic said he would try and get me another clamp to make the repair more secure. He never did and the repair lasted all the way home. Camping Ferdaous. 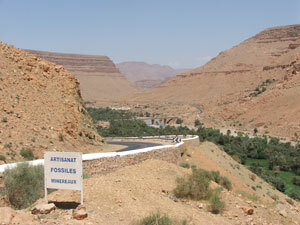 Is a large level gravel site about 8 miles from the centre of Marrakech. The site runs a mini bus service into the centre at a cost of 10Dhms each way. There is a small café and shop and free WiFi. A swimming pool is under construction. Day 24 Marrakech. 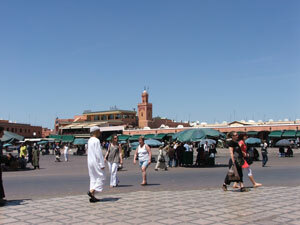 We had booked an introductory tour of Marrakech and we set off in the site’s mini bus at 9 a.m. I had to lift Wendy in and out of the front seat and the wheelchair was placed in the back, folding one seat away to make room for it. After meeting our guide for the day who proved to be very good, our first port of call was The Jardin Majorelle. This was once home to Yves Saint Laurent who in fact was Moroccan. He set up a trust to preserve this fantastic garden which, for me, the highlight was the many forms of cacti in magnificent settings. Cascading bougainvillea, in its many colour forms were also eye catching. The site is mostly wheelchair friendly. However, there are one or two small steps to negotiate. Our next visit was to the burial grounds of the early Kings of Morocco. These have only been recently discovered and the only way in is via a narrow passage which was only just wide enough for the wheelchair. Most of this ornate site can be seen with ease. However, it soon got crowded making it more difficult to get the wheelchair to view points. A visit to the Bahia Palace then followed, Of the many palaces in Morocco, this is the only one open to the public. The visit was made very interesting by our guide who pointed out hidden features and explained the functions of the many decorative rooms and fine courtyards. There are many changes of levels, mostly by single step and by the end of the visit, maneuvering a wheelchair over these was becoming tiresome. A walk through some of the souk brought us out at a Spice and Herbal practitioners where the uses of the most common of these was explained to us. Herbal remedies are much favoured in Morocco and this was clearly a thriving business. One can have a relaxing neck and shoulder massage, for which you are expected to pay a few dirhams and of course there is the opportunity to buy products. We purchased some cooking spices, lip salve and some Argan Oil. Our final short visit was to the main square which was quiet in the heat of the day. Nevertheless there were a few entertainers and stalls to be seen. We did not linger long in the heat and went for an optional lunch which was on the roof of a building. This was not a problem as help was at hand to carry Wendy and the wheelchair on a scary ride, up three flights of steps to the top. Here we had an enjoyable lunch, Moroccan style, on low tables in pleasant surroundings. We were back on site by 1530hrs and after a short rest visited a local supermarket to top up with essentials before retiring for the evening. A very enjoyable but tiring day and we slept soundly that night. Day 25. A more relaxing day, we chose a 10 a.m. start, a mini bus ride into Marrakech to visit a fixed price store. What an Aladin’s Cave! I don’t think there was much you could not buy there that was made in Morocco. We did not really want anything but somehow managed to spend 1000 dirhams. Not wanting to wander the souk, we made our way back to a café opposite the Grand Mosque which was our pick up point. Here we watched life go by for about an hour over a couple of coffees with fellow travellers, Pete and Pat. Marrakech is surprisingly wheelchair friendly. There are no dropped kerbs but most areas are paved or you take your life in your hands and do as the residents do and stroll along the roads but be sure to face oncoming traffic so you can dodge the many mopeds, or scooters which tend to appear from nowhere. Arriving back at site at about 1330hrs we did a few chores and chilled out for the rest of the afternoon because having booked to go to ‘Fantasia‘, we envisaged a late night. We were picked up by mini bus at 1945hrs for the short ride to the venue. ‘Fantasia’ is an expression of Moroccan culture and horsemanship. Our driver escorted us to our tent and dinner table, giving us an explanation of the place on the way and showing us some of the traditional marriage costumes on display. The entrance was impressive and ramped. On the way to the table we passed bands and groups of people dressed in costumes of their region. There was a single step up to the dinning area and later we were to find that access to the toilets was via 4 steps and difficult. We ordered drinks and were served with a four course meal, soup and bread, a whole lamb on a platter between six of us which was exceedingly good but we could not finish. This was then followed by couscous with vegetables and chicken, we barely made an impression on it, and finally, a large bowl of apples and oranges. We only had time to finish an orange before we noticed people gathering around the arena. The arena is surrounded by a low wall and stone seating and there are very few gaps in this where a wheelchair can have a good view. We made for one of these. We watched a camel giving rides to youngsters but it was not long before the first horse and rider appeared and we were treated to a display of Arab riding which included stunts and mock charges at an unseen enemy which included the discharge of vintage rifles. The evening concluded with a short firework display. The meal was excellent, the show good but not very slick. Only six of our party went, the remainder went into Marrakech for the evening, by all accounts we did the right thing! Day 26. Our last journey of the tour was to Essaouira and Camping Sidi Magoul. It was a short run of 116 miles but due to road works it was very rough. We left at 8a.m. arriving at about 1130a.m. We stopped only once to photograph goats in the trees and I was amazed to find that my temporary repair to the exhaust survived the rough road. After lunch we walked into town and round the interesting harbour which was packed with fishing boats. The town looked interesting but we decided to leave its exploration until tomorrow. Camping Sidi Magoul is a small site with some shade and clean but simple facilities and not far from the beach. There are no marked pitches and it is about 2-1/2miles from the town centre but it is a pleasant level walk along a paved sea front into town. There is a short stretch of rough ground to traverse before the paved area but once the latter is reached the majority of the route into town is wheelchair friendly. Day 27. Essaouira We set off at about 9a.m to walk into Essaouira stopping on the way for a coffee and to watch life slowly awakening. We then continued on into the souk and spent a pleasant couple of hours mostly window shopping but we did replenish our lemon store for gin and tonics and purchased some tea and a leather belt. We had a pizza and a drink in a seafront café and then walked back for a rest during the heat of the day. The tour ends today in Essaouira, one of our guides Hamid left for home yesterday and Ray and Steve will be leaving us very early tommorow morning. Tonight is our farewell dinner and we meet at 6p.m. in town. We gathered at the appointed place after another walk into town and were taken to a nice restaurant in a hotel where we had a three course meal, we chose fish brochettes for the main course washed down with a bottle of local red wine. We said our goodbyes to the tour leaders and strolled back to the campsite under the guidance of a near full moon and the stars. Day 28. We didn’t sleep very well and also awoke early so left site at about 0715hrs for Ceuta. We planned a night stop on route which we had agreed with some of the others of our party. In the event this meeting up was a bit of a hit and miss affair but it did work out in the end. We set off alone up the coast road in thick mist to Safi and El-Jadida. The coast road, we had been advised, was more picturesque and much quieter than the main road and we made good time and by 10a.m. the mist had largely disappeared and the fine views were revealed. We stopped for lunch at a scenic pull over just before El-Jadida. One of our group was already at this spot and another joined a few minutes later. 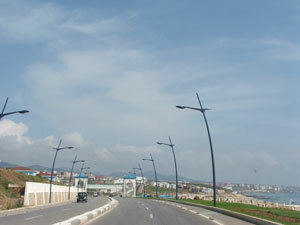 After lunch we again went our seperate ways heading for the toll motorway for Casablanca and Rabat. We arrived at our pre-arrange meeting point at about 1630hrs and were surprised to find no one else there. We didn't much like the look of this "aire" and wondered if others had thought the same and had moved on. We waited half an hour before moving on to the next Aire de Repos at Larache. Again no one was there but we decided to stay the night here anyway. We had travelled 386miles for a toll charge of 101 dirhams and were tired and hungry. Half an hour later two other motorhomes from our group appeared, these were quickly followed by two more. Fortunately all had deemed the meeting point unsuitable for a night stop and had travelled on like ourselves. After an exchange of tales of the day we settled down for the night. The aire was noisy with the comings and goings of heavy vehicles most of the night and we did not sleep too well. Day 29. We were up early and on the road shortly after 0700hrs. By the time we had paid our final toll of 70 dirhams I had little local currency left so did not visit the supermarket near Martil like the others but used the last of my dirhams to fill up with diesel at 7.25 dirhams a litre (about 60 pence per litre). From our night halt, it was only a short run of about 96 miles over the Rif mountains to the ferry terminal. A scenic run and we parked on the front just before the border at about 10a.m. to collect our documents together before proceeding further. We ignored all the touts at the border and the formalities were completed in half an hour. Adjusting our clocks to Spanish time which was 2hours ahead of Moroccan time, we headed for the ferry terminal to await the 1445hrs ferry. 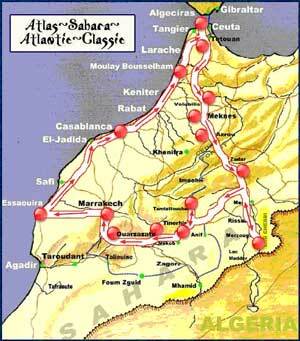 We had travelled 1547 miles touring Morocco since departing Ceuta 20 days ago. The crossing was quick and smooth and we were on our way to pick up our dog by 1630hrs travelling the 70 miles via the Autopista in just over an hour. Barney our dog was overjoyed to see us and was fit and well. We then headed for Camping Monte Parc for the night where we met four of our fellow travellers for a farewell drink in the bar before retiring late. Day 30. After farewells, we left at 0915hrs, stopped briefly at the Mercadona supermarket near Malaga, and then setting off on the long 311mile drive via Granada to a friends villa near Torreveija. Using the Autopista for the last 70 miles we arrived just before 1800hrs and spent a pleasant evening with friends, wild camping outside their villa. Day 31. A late start but a short 43 mile drive to Banus de Fortuna where we pitched up at Camping Fuente and set about the chores of cleaning the inside of the van and ensuring the laundry was up to date. We stayed here for 3 nights. The next day was a public holiday so we expect the site to be busy as it’s spa facilities are popular with day visitors as well as campers. As a precaution I booked a table for 6 in the on site restaurant for lunch the next day because tomorrow, my brother and his wife and our friends from Torreveija will be joining us for the day. Camping Fuente. Always busy at weekends, this is a well maintained popular site with the Spanish. This is our second visit here and we chose a pitch with private toilet facilities. The pitch used for the disabled had workmen on it for the second year running but this time they gave us two pitch keys, the one used by the disabled and the allocated pitch key so that at least we could use the disabled shower and toilet facilities even if we could not have the pitch. The site has a good restaurant and the swimming and spa pools are naturally heated from thermal springs. Day 32. May 1st and the site has filled up for the holiday. Took the dog for an early walk, back by 0930hrs just as the day began to warm up. Wished I had taken the camera, the views back to the site in the shadow of the mountains were superb in the clear morning air. Our guests arrived at about 1100hrs. We had a three course menu of the day lunch and drinks in the on site restaurant for the cost of 10 euros per head and spent a pleasant day together. It clouded over in the afternoon and tried to rain and finally succeeded in the evening. Day 33. This morning I took the camera on the early morning walk. It was very peaceful, no unnatural sounds, only the crunch of the gravel surface under foot, the singing of the birds and the distant sound of a cuckoo broke the silence. I was again back by 0930hrs but this time the day was starting much cooler after the rain. We paid 5 euros each for the day to use the spa pools and had a morning swim and coffee in the poolside café. Today is going to be a lazy day for tomorrow we must make inroads into our journey back to Calais. Day 34. We took the local roads to El Pinos and Elda and then took the CV80 and A7 to Alcoi. The morning started bright but the cloud hung low over Alcoi and we drove by the town in thick mist and light rain with the occasional downpour. The temperature also dropped to a chilly 14C. It eased a little as we circumnavigated Valencia but by the time we got to the Carrefour at Vinaros the rain was torrential. We topped up with food and headed for Camping Alfaques just off the N340 at Alcanar, an ASCI site listed as costing 15 euros a night. The days run 243 miles. Camping Alfaques. A strip of land alongside the beach, level but with very small pitches and many statics. Access would be difficult for larger vans. We parked in the first suitable spot we saw which happened to be right at the sea front. The temperature fell even lower in the evening to a chilly 10C and being on a hook up, we used the electric heating overnight. There was good free WiFi access to compensate for the weather and I was able to catch up with family news and post a few emails. 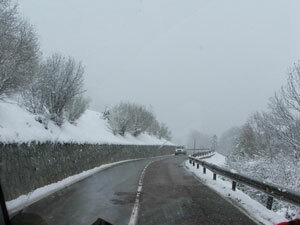 However the weather forecast from the BBC for the area and also for the whole of the Pyrenees looked bleak. Day 35. We contemplated changing our route to make the best of the weather as the morning forecast was still poor for the next few days but there seemed no alternative and rather than waste a day on a significant detour, we stuck to plan and headed for the Pyrenees and the Vielha Tunnel via Tortosa and Lleida (Lerida). The weather was better than expected, if a little cool at 14C and the road excellent as far as Lerida. Yesterdays rain had cleared the air and we could see the snow capped Pyrenees from well over 100 miles away. 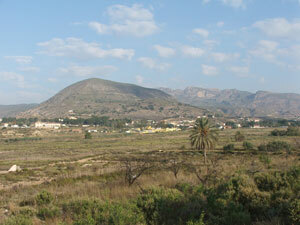 The road, the N230, deteriorated after Lerida and was badly in need of repair for the first 20miles. However, the views were stunning and the road slowly improved as we climbed the foothills of the Pyrenees. As we approached Vielha the tops of the mountains looked shrouded in mist. We were soon to realise from the oncoming trucks which sported what appeared to be frosty front grills that this could be otherwise. The temperature plummeted to 5C and it was not long before we encountered snow, light at first, but by the time we entered the tunnel it was quite heavy and clearly the snow ploughs had already been out. It was even heavier on exiting the tunnel and it was already 3 to 4 inches deep on the verges and the road was quite slushy. We had intended to stop at the aire in Bagneres de Luchon but thought it best to get to a lower altitude for the night. We found a site at St Bertrand de Comminges. At this lower altitude the snow had turned to rain and all the pitches at Camping Es Pibous were 2 inches deep in water except for an area of hard standing near the swimming pool. The owner said I could pitch on that. The days run was 230 miles and it was by now getting late, there was electricity available so we pitched up for 14 euros for the night. It was still raining hard when we retired for the night and the thermometer registered 3C. Camping Es Pibous. Not all facilities were open at this quiet site located in the foothills of the Pyrenees and within walking distance of the village and its magnificent hilltop church. However, what was open, I thought very basic. All weather roads lead to pitches which were of a reasonable size, each with electricity and water. There was a motorhome service point but I had difficulty using it. It was more suited to the smaller motorhome. Day 36. It was light rain when I took the dog for his morning walk. The countryside was much greener than when we passed this way a month earlier and many spring flowers were out in spite of the cold snap. We had decided to travel further north to see if we could leave the weather behind. We set off late for Bergerac taking the D929 to Auch and then the N21 to Agen and onwards. It rained the whole day, light at first but by early afternoon it was very heavy. We found an aire at Fleurance for lunch but the aire at Bergerac was not suitable for an overnight stay. The bays were small and I could not quite get off the busy main road which ran alongside. Disappointed and by now fed up, we searched our guides for somewhere close at hand to stay. The occupants of a French motorhome were doing the same and left just ahead of us. We set off, took a wrong turning, and found ourselves continuing up the N21 and came across a rather poor site a few miles further on. It was still raining hard mixed with sleet as we pulled in. Thankfully we noted that the pitches were not swimming with water and looked firm enough to cause no problems. We had a friendly welcome from an elderly lady and for 10 euros we pitched up with no electric for the night at Camping Le Campagnard. It finally stopped raining at about 2000hrs but was still very cold. The temperature was only 5C and this was southern France in May! At least it was quiet. The days run was 162 miles, tomorrow we plan a shorter day’s driving! Camping Le Campagnard. A very basic site mainly occupied by itinerants. Its saving grace was the hard standing pitch we found which had a good slope on it which drained the pitch well so we were not paddling in and out of the motorhome. There was some noise from the adjacent N21 but this was not troublesome and we slept well until the lorries started moving along the road a about 6a.m. Day 37. We planned a short run today, even so we were on the road just after 9a.m and stopped at a large Auchan on the outskirts of Perigueux. Again it was a miserable morning until about 11a.m when the drizzle ceased and there was a noticeable rise in the temperature. Still quiet chilly at 12C but there were signs the weather was clearing. It was much brighter but still cloudy when we pulled into the aire at Brantome for lunch after which we spent a pleasant couple of hours by the river and in the town. We sought a quiet site for a couple of nights stay and came up trumps with a little gem, Camping Chez Rambaud, located one mile outside the small village of Les Salles Lavauguyon, south west of Limoges. The sun was shinning when we arrived and it was a beautiful evening in a beautiful location overlooking a wide wooded valley. Camping Chez Rambaud is owned by an enthusiastic English couple who have built up this small site over the last 6 years. Located in the countryside all six pitches, two of which are hard standing, have great south west views It is in a very tranquil rural setting and ideal for those wanting peace and quiet and who enjoy walking. The only noise is that of the many birds during the day and the nightingales at night. 10 amp electrics are available and full toilet facilities including one suitable for the disabled. We loved our two nights here although a charge for the dog made it a bit on the expensive side. Day 38. A cloudy day with the occasional sunny periods. We had a lazy morning, I did walk the dog in the woods, and after a light lunch we walked the mile into the village and back again. Not a great deal to see, the church is very old and mildly interesting. However, we enjoyed the traffic free walk through unspoilt countryside. Day 39. Raining again, light but still a wet walk with the dog. We left late but our target today is Cheverny and Camping Les Saules where we also stopped last year. Not a long journey but like Winnie the Poo, we seemed to have a little black rain cloud hovering above us. We would drive out of the rain only for it to seemingly catch us up again. It was like this all day as we took the local roads to Limoges followed by the A20 to Chateauroux and the D956 towards Blois. We stopped for lunch, fuel and to buy wine and arrived at about 1600hrs. The days run 163 miles. Camping Les Saules. This popular ASCI listed 15 euros per night site is among mature trees and is located just outside Cheverny. It has all facilities including a dog walk and there is a large Super U supermarket and fuel station about 4miles away in Contres. This an ideal base for touring the Loire Chateau. Day 40. A damp night and misty start. We were away early, I wanted to get to our destination before the start of the Spanish Grand Prix so we drove straight through to Les Anderlys and Camping L’Ile desTrois Rois via Blois, Chateaudun, Chartres, Dreux and Evreax. Les Anderlys is a town or rather two adjacent towns, Grand and Petit Anderlys, the latter and the campsite being on the banks of the Seine up stream from Rouen. The days run was 154 miles and we arrived just after 1p.m. The weather had cleared and the temperature much improved. The sun was out, when after the Grand Prix, we set off for a walk along the pleasant river front into Petit Anderlys after which we settled down for the evening. I noticed the ruined Chateau which overlooks the site was beautifully illuminated when I took our dog out for his late evening walk. Camping L’Ile desTrois Rois. Another ASCI listed 15 euros per night fairly open site on the banks of the Seine. Pitches are grassy and very large and the site is overlooked by the ruins of Chateau Gallard, a defensive fortress built by Richard the Lion Heart. Day 41. 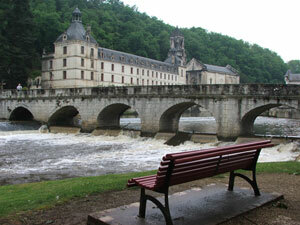 Forges Les Eaux, our next destination was only 39 miles away so we were in no hurry to depart. The sun was out and there was hardly a cloud in the sky as I walked the dog up to the ruins of the Chateau 300ft above the river. The views over the country side, the town and Seine were superb and the effort of the steep path was well worth it. We set off at 1030hrs and arrived at Forges Les Eaux aire an hour later. It was then I noticed a diesel leak. I had been wondering where the oily deposits on the motor home steps had been coming from! In the wet conditions I thought it was road grime, now I knew different. It didn’t look serious, had I been over filling the tank? We only had two more days driving to go so I decided further investigation could wait until we were home. We were going into town for lunch. However, in helping Wendy down the motor home ramps, I pulled a calf muscle and could hardly walk. We had an appointment with the vet in the evening to validate our dogs passport as well. How was I going to manage to walk the dog there? Lunch in town was cancelled and I took some pain killers and applied ice packs and decided if the worst came to the worst, I could use Wendy’s power trike. This is what I did which saved the walk to the vets and back. Forge Les Eaux Aire. A very pleasant, quiet, level, tarmaced area opposite the municiple campsite, 5.75 euros per night with electrics. Water and disposal facilities are also available and it is a 15 minute walk into town which has good assortment of shops and restaurants. Day 42. It rained overnight and dawn brought a grey morning but it had stopped by the time we had finished breakfast. We leisurely prepared for the road and decided on such a grey day to head straight for Calais via Neufchateau, the A28 to Abbeville and then the D1001 to Boulogne. The day brightened up as we leisurely drove along and after a lunch stop we decided it was worth taking the scenic coast road from Boulogne to Escales where we planned to stop at Camping Les Erables. There was a strong northerly wind on the coast which made it very unpleasant when out and about. We pitched up to give maximum shelter but still had a view over the sea to the white cliffs of Dover which could clearly be seen. We now only had a very short drive to the tunnel. The days run 117 miles. There still seems to be a leak of what looks like diesel fuel, its not brake fluid, the reservoir is still ok, fuel consumption seems fine so I am wondering if I have a front suspension leak? At least the repair to the exhaust with the tin has held for nearly 2000 miles! Note I had the brakes, air intakes, filters and leak checked over and the exhaust repaired by my local garage on our return. The brakes and filters were ok and some sand was removed from the air intakes. It was a diesel fuel leak. A union nut on the injectors was loose and required tightening. Its open to daebate as to whether this had worked loose or had not been tightened sufficiently at the last service. However, diesel leaked into a scuttle which then overflowed and, on removal of the top engine cover to cure this, a pair of pliers were found. These had been left under the engine cover during the service which had been done before I left for the trip! I will be returning the pliers to the Mercedes agent concerned! Camping Les Erables. 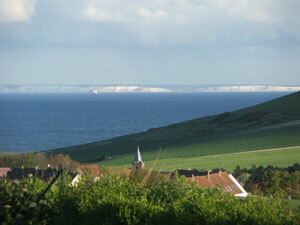 A terraced site overlooking the channel with views to the white cliffs of Dover. The cost is 9 Euros for the night without electricity, plus 3 euros with electricity and it is very handy for the tunnel which is only 8 miles away. Pitches are generous and most have gravel tracks laid down to improve wet weather traction. There is a motorhome disposal point which can also be used at a cost of 4 euros if not staying the night. Day 43. Our final day arrived bright and sunny but still with a bitter northerly wind. The English coast stood out sharply in the sunlight and clear morning air. The buildings in Dover were clearly visible to the naked eye. It would not be long before we would be home. A short drive to the tunnel and we quickly completed the formalities and in contrast to our outward journey we were away on time and in England by 0930hrs and home for lunch. The total journey was just 3 miles short of 5000 miles.